Wayne's World- The Official Blogspot of Wayne Royale: WAYNE ROYALE'S MIXXCITY RADIO PRESENTS NEW EPISODE OF WAYNE ROYALE'S MIXXCITY RADIO 47 FT. COOL V & TEK FROM SMIF N WESSON! WAYNE ROYALE'S MIXXCITY RADIO PRESENTS NEW EPISODE OF WAYNE ROYALE'S MIXXCITY RADIO 47 FT. COOL V & TEK FROM SMIF N WESSON! 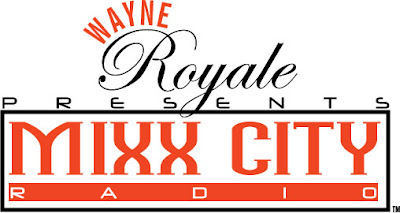 Make sure you check out the new episode of Wayne Royale's Mixxcity Radio pt. 47! I have new music by Usher, Corte Ellis, Drake, Jay-Z and much more. Shouts to special guests, Cool V and Tek from Smif N Wesson! Click on the BlogTalkRadio side player to play the episode. Catch me next Sunday at a special time at 8pm. EST/5pm. PST. Catch up on past episodes at www.blogtalkradio.com/wayneroyale and www.imeem.com/wayneroyale!